Wide-bore MRI systems are becoming the norm to accommodate large patients. Wide bore magnetic resonance imaging (MRI) systems have allowed radiologists to offer patients the optimized comfort of conventional open bore systems, as well as the high-quality imaging of conventional closed bore systems. Because wide bore MRIs have broadened the demographic of patients who can be tested, the systems have gained widespread adoption in use, with many practices opting to equip their offices solely with wide bore systems. For years, conventional open MRIs were the only options for a large number of patients. “With the classic open MR technology, the sides were open, and you could see out all the way around,” said Karen Botts, director of imaging, PinnacleHealth, Harrisburg, Pa. These systems, however, did not produce the same high-quality images that physicians were used to. A main reason these new wide bore machines have become so widely popular is because they have allowed those patients who cannot fit into conventional MRI machines — for example, obese patients or patients with wide shoulders — the option to have MRI tests done. “The population of the country, and certainly in our area, continues to grow in regards to body habitus,” said Botts when discussing PinnacleHealth’s decision to purchase a wide bore scanner. “Our ability to serve certain people in the population was starting to decrease with the smaller bore scanners and with the weight limits that they started out with.” With the addition of a new wide bore scanner to the practice, PinnacleHealth has been able to provide the best service for the largest number of people possible. Botts said that due to the increased comfort, patients request to have their tests done in the wide bore scanners. “At one site we have two different scanners. Patients come in, look at one and look at the other, and specifically ask to go on the bigger bores. The most important advantage of new wide or open bore MRIs is that they combine patient comfort with high-quality imaging. According to Day, as the opening of an MRI scanner gets bigger, it becomes very challenging to create an MRI image. Botts said that the poor image quality of conventional open bore systems was due to the field strength. “You can’t get the same amount of magnetic field with a conventional open MR as you can with the closed. I believe most of the conventional open MRs are 1.0 Tesla at best,” she explained. Before Day adopted wide bore systems at his practice, his dilemma was whether to market conventional open MRI systems to the patients for their increased comfort, or to buy a 1.5 Tesla, high field, tunnel, claustrophobic magnet because referring physicians preferred the image quality. With the acquisition of Siemens’ Magnetom Espree, he was able to talk with patients about comfort and to referring physicians about quality. “It was the perfect marriage of the high-quality imaging with the patient comfort,” Day said. Today, Day relies solely on wide bore MRIs. “We would never purchase anything but a wide bore magnet now. It would be very hard to explain to our patients,” he stated. With increased speed and comfort, wide bore MRIs have helped both PinnacleHealth and Zwanger-Pesiri increase patient throughput. Day said that the wide bore systems have allowed Zwanger-Pesiri to image faster and do studies quicker with better image quality. What would typically take 45 minutes to an hour, now takes staff only 15-20 minutes. “There is obviously an economic benefit to us if I can perform two studies per hour instead of one,” Day said. Decreasing the study time also proved to be beneficial for patients. “If you are having back pain, 45 minutes of trying to lie still can become very uncomfortable. So, what the patients really like about the experience is the comfort that came from tests being so much faster,” Day explained. To learn more about economic considerations, read the article "Economic Considerations of Wide Bore MRI." 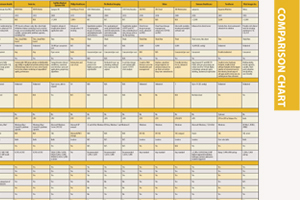 This article served as an introduction for the ITN comparison chart on wide-bore MRI systems. The chart includes all the players on the U.S. market and offers an apples-to-apples comparison of technical specifications. The chart requires a log-in, which is free and only takes a minute to sign up. It can be accessed at www.itnonline.com/content/mri-wide-bore-systems.